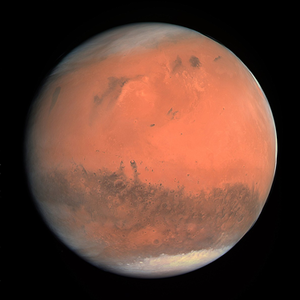 Mars is a terrestrial desert planet with many mountain systems and craters. The soil on the planet is a reddish-orange due to its high concentration of iron oxide. The planet has a very thin atmosphere, significantly less gravity than Earth, and cannot be easily terraformed due to its lack of a magnetosphere. The atmosphere consists mainly of a thin layer of carbon dioxide and other greenhouse gases which have begun to build up from industrial output, but the pressure is still around a deadly one-hundredth of that of Earth. Due to the hostile conditions on the surface of the planet, settlements have to be environmentally separate from the natural state of Mars. As a result, most settlements on Mars are built under domes into the various craters which dot the surface. Some are dug into mountains or hillsides, or just built mostly underground. Still others consist of connected above-ground structures or towers without a dome, even if the dangers of an environmental breach are much greater. Building domed settlements in pre-existing craters remains to be the most popular (and often cheapest) means of establishing a system of living on the Red Planet. Inside Martian settlements, artificial gravity is generated to ensure Earth-like conditions. Settlements are usually connected by underground maglev trains, which both carry people and goods from one dome city to another relatively quickly, with a few more isolated ones only being able to be reached with aboveground vehicles. Air traffic is not common, restricted to unconventional and spacecraft-like vehicles, due to a lack of atmospheric pressure. For the most part, Mars is inhabited by humans. Positronics have a relatively large presence on the planet as well. As most inhabited areas in human space, small amounts of other species can be found inhabiting the planet, but their combined presence makes up less than one-percent of the overall planetary population. Some locations have specific and clearly identifiable ethnic roots, but many are wild, varied and intermingled, owing to the rampant early colonization of the planet. Mars is the largest manufacturer in SolGov space. Sometimes called a factory planet, the domes and caverns of Mars are jammed full of factories producing anything from communicators to positronic brains to pre-assembled furniture. Most factories are vertically integrated with nearby mining operations, parts factories, and sometimes hydrocarbon foundries. Xion Manufacturing Group is the largest single employer on Mars, and has its headquarters there. Mars' spaceports are second only to the great shipyards of Luna in the Sol System, and is a massive locus of trade and interstellar passenger transit. Many big names in shipping, including Major Bill's Transportation, got their start on Mars, although most of these have moved to be closer to foreign trade. Mars' population (the greatest of any world of its kind) leads itself to a thriving secondary industries in service, arts, entertainment, and education. Mojave University, the oldest state school outside of Earth, serves an astonishing number of students from all over the Core World and beyond. Mars is almost as territorially fractured as Earth itself, owing to its history as the site of various colonization efforts from Earth-based governments, corporations, scientific consortiums, and the Selene Federation of Luna. During restructuring in the post-Second Cold War colonial era, many independent Martian colonies were established, and many existing territories seceded from mostly-impotent Earth-based home governments. Most territories are run as SolGov-style parliamentary republics, but corporate-controlled states are also common. Most states are SolGov member states, with a good number of protectorates and a handful of surviving extraterrestrial outposts of Earth governments. Tharsis is primarily built into the steep valleys of the Noctis Labyrinthus which give it an almost organic appearance when viewed from above, though the city extends deep into the mountains connecting the covered outdoor sectors. The city is best known for the prestigious Tharsis University, one of the earliest academic institutions to be established in the region. The University is renowned for its electronic and mechatronic engineering research, which has in turn attracted a sizable presence by Trans-Stellar Corporations, particularly Xion Manufacturing and Ward-Takahashi, who operate a large number of manufacturing, and research and development facilities in the city. Olympus is the former site of a proposed SolGov “planetary capital” intended to be built in the caldera of Olympus Mons in the early 25th century. The project was initially met with enthusiasm by investors from member states, and construction began in earnest. However, a series of practical setbacks compounded by the isolation and harsh terrain of the construction site led to the project rapidly going over budget, and ultimately being abandoned. The partially complete infrastructure and structures - intended as temporary worker's accommodation and fabrication plants to produce the high volume of materials required for the construction of an entire city – were sold off piecemeal to private interests. The site has become a sprawling network of mostly unrelated surface-level facilities and habitats, ringed by the looming support structures that were once supposed to be the foundations of the city's impractically large dome. Olympus has gained a reputation for being especially remote and more crucially, lightly surveilled. While far from the most populous settlement on Mars, it holds infamy as perhaps the largest failed megaproject in the galaxy. The Martian colonization effort took off during Earth's ecological crisis and the ensuing cleanup. Mars was nearby and contained all the raw material for human industry without a local biosphere to pollute, and so manufacturing interests moved there in droves, augmented by the Earth refugee labor force. Many notable Trans-Stellar Corporations got their start in this era, and Mars contains a large number of corporate headquarters in their massive cavern cities. This page was last edited on 5 September 2018, at 17:04.